-now people will have to get used to living with less predictability in the economy for several years. -on the whole as an organization giving to individual missionaries in down 5%, in past economic declines, giving hasn't been affected. -as giving drops, it will flatten out... it will not likely increase for a long time (even though cost of living does)... we will need to adjust. Several of you have asked how the economic decline in the U.S. is affecting us, well there is the paraphrase. Personally we are still able to make ends meet, we have had to get creative at cutting costs and such, but it only accents how thankful we are for all of you that support us knowing that you each have your own economic pressures. We want you to know how much we value you, and look forward to photos of you to put on our prayer board so we can uphold you in prayer. We also want to remind you that you are not supporting a lifestyle, but a goal. A mission. It is our mission to serve God's glory with our skills and those skills are going towards getting the Word of God into the hands of people who could never read it before meeting us. Spreading the Gospel. Let's see, this weekend was a lot of fun, activity, punctuated with moments of rest. Kendal and I flopped down on Friday after having gotten our conference duties finished. She is in charge of the children's ministry for conference... overseeing a team who came from the U.S. to minister. 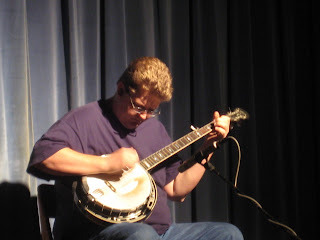 Saturday I performed in a concert we have every 2 years.. playing banjo. 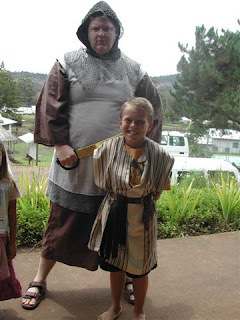 Sunday I performed as Goliath in a skit in front of the whole church, because the original Goliath was unable to at the last minute. Monday we had a nice spiritual retreat, a true day of resting in God, meditating on the Word and praying and listening. 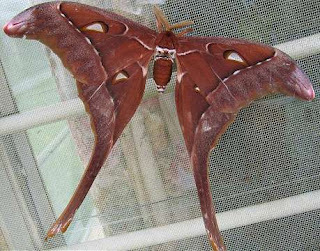 One of the many beautiful moths we see in this country. Also we see some nice butterflies. For the next 2 weeks we will be hosting a 15 year old girl, the daughter of some of our friends who needs a place to stay for 11 days. During this time we will also be attending and facilitating a 2 week long business conference. 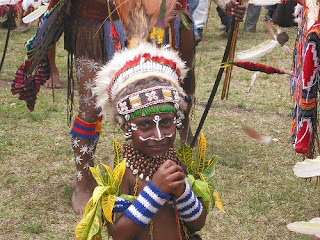 Kendal will be handling/coordinating the day care and Vacation Bible School with a team from the states. I will be doing the technical side (with others). Networking/wireless/projection/file sharing/messaging/email etc. It's been a very busy couple of weeks preparing, so I thought I might post a few fun pics, being that I might not be posting much for 2 weeks (or I might, you never know). 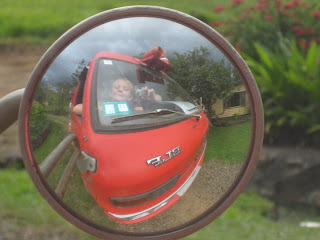 but after putting the last blog post up, I felt a definite lifting of my mood! I got an email that said "Chad why is this email bouncing, please fix." and the email sent to me was titled "Spiritual Warfare" and it had several verses in there and so while I was troubleshooting this email issue, I also went through the verses and was greatly encouraged and helped. Please be praying from today through April 12th (Easter) for our family and our center. -I got a real bad case of being glum. -We haven't seen any real sunshine for a few months. -Everything is going wrong today at work, problems and pressures. -Friends are getting dramatic calls from home. -We'll be having a 15 year old move in with us for a few weeks as she has no place to stay. The other day I was sitting there thinking "wow, a lot of stuff is going on, bad stuff." 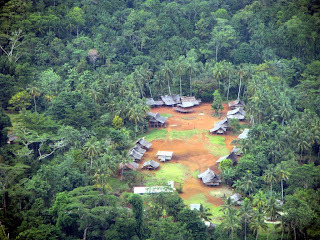 Neighboring clans are fighting amongst themselves out in the villages right now. And it dawns on me... WOW THIS could be a spiritual attack. Since I had that revelation, there has been some light. PLEASE pray against the enemy. I don't know if God is going to move greatly during our conference (starts this week, ends April 12). It is a 2 week church meeting of sorts, and both Kendal and I are deeply involved in it's success. The last 2 weeks have been tough. We've had everything around us start to suddenly have an increase in "drama". Some friends hurried back to the states this week because of family issues. I know this term is scary to many, it was to me... but it is a daily thing here. Even something as simple as exhaustion can be an attack. So if you have a few minutes, pray that God would cause the enemy to flee from us, from our family, from our center, and that God would work greatly here these next 3 weeks. You know, how life has it's regular times, and then it's sudden new dramatic times? Then it has its "when it rains it pours" times? This is a "raining and pouring" time in almost every sense of the word. Every single thing around us right now has drama... a term I used for.. increased problems and stress. We could use your prayer. Our center has a volunteer fire squad, and a Japanese fire truck with customizations and conversions done by our auto-staff here. 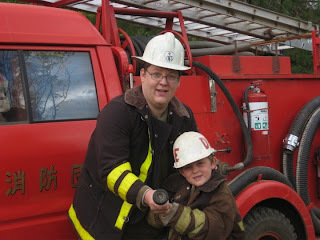 Each month we take turns taking the truck out, fire it up, drive it, test the hoses, etc. This month was my turn and I brought my son with me. We stopped to take a few photos after running all the water. If ever we fight a fire, I'll let you know. If a weekend warrior is a reservist, what is a "I drive the truck once every 5 months and never fight a fire" person called? .... Safe. I really liked these two. 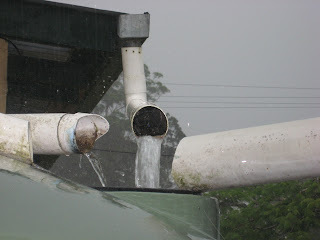 It has been raining a LOT lately, usually when it rains we have a slow trickle into our water tank. My wife took a photo of the down pouring into our water tank during a heavier time of rain this week. Our yard is swampy. 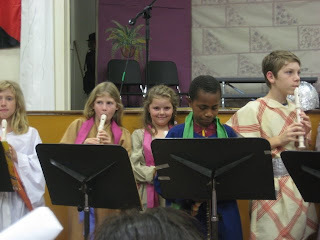 On Friday Sydney, had performed in a musical in which she had a solo. She surprised us when she told us she tried out for it. And she did a GREAT job of it. It was nice to see her enjoy it. 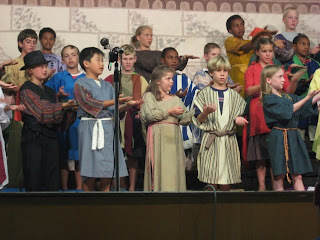 They did like 4 performances. 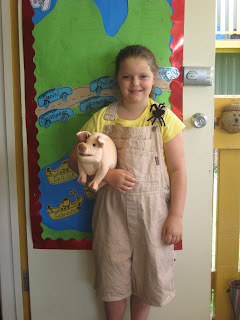 The school doesn't celebrate halloween (which I'm glad about), but they do celebrate book week. For a week (or 2) they have the kids compete in reading. Classes compete against other classes for reading hours, individuals for book cover art, and they dress up on the last day and march in parade dressed as one of their favorite book characters. Sydney got first place for art in her class and Calvin got second place for art. Kendal made the costume for Calvin. 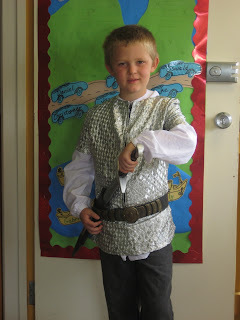 The question was "how to find a chain mail vest".. well, KEndal headed into town, found this silvery dress, and altered it. Then a friend found the belt in town.. Calvin felt like the star with this costume.. and we were very glad the whole getup cost around a dollar. It is simply amazing what you can find in thrift stores. There are few "new" clothing stores in this country, you can buy some new clothing, but the thrift stores are packed every day. Most of the folks in this country are wearing clothes passed down from other countries and very rarely understand the logo they are wearing. I saw a guy with a "raiders" t-shirt on and instinctively began to mock him jokingly, when I realized, he has no idea who the raiders are. No this isn't a Vietnam prison camp photo. It also isn't a movie set. 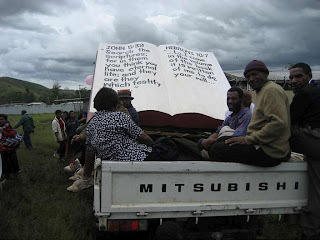 This last week the Mape language group had a Bible Dedication. This is where it was held. Today I was able to view photos of this dedication, of which we all have played a part, but was unable to go. What I was able to do, was to explain to a national who was trying to tell his family how to plant coffee, the very simple procedure of compressing images in a Word document so that his 16mb files could become more like 1/2 mb files. I don't know in the long scheme of things how helping a man compress images helps, but I know that the teaching experience, helped build our relationship more.